Friday 4th March 2016. Tickets £7 online or £9 on the door. Concessions for students and over 65′s £6 online or £8 on the door. Have you ever heard contemporary big band jazz at CICCIC? If not then you’ll be amazed by this concert by newly formed Def. Tone 17. Last time they played we had standing ovations and big band jazz just sounds great in our candle lit acoustic memorial hall so not to be missed. They’ll play tunes you will recognise and you’ll even get the urge to dance. Who are they? What are they? 5 Saxes, 4 Trumpets, 4 trombones, 4 More. Roof raising BIG jazz band. Improv. Contemporary. Mingus. Loud. Quiet. Boof. Fun. Serious. May contain nuts. No flash gits. No dress code. Weather Report- More improv. Dancing on the edge. Good. 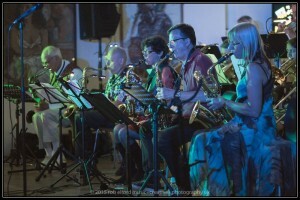 Although big bands are often stereotyped as purveyors of 1930s–1940s dance band music, many composers have continued to be fascinated by the play of composition and improvisation inherent in large jazz based ensembles. But this gig through Def. 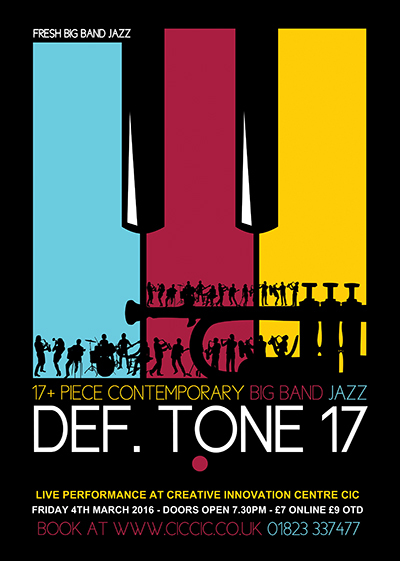 Tone 17 will allow listeners to explore the different ways in which the big band has been (re)imagined by contemporary jazz artists; gaining a practical understanding of the creative possibilities of the contemporary big band. A truly one-off experience for those who love all form of jazz. Due to the size of our bands spaces are even less than normal so if you want to be the first to experience this amazing you should book as early as possible. Doors open at 7.30pm we start at 8.00pm.